There are times when the only way to get rid of a stubborn weed is to treat it with an herbicide. Don’t be afraid to use herbicides if you need them, but try other control methods first. Pulling, hoeing, tilling and digging will often take care of weed problems without the need for chemical sprays. Let’s learn more about using herbicide in gardens. Herbicides are chemicals that kill plants or prevent them from growing. Their method of killing plants is as varied as the plants they kill. The first step in understanding herbicides is to read the label. Labels tell you how to use herbicides safely and effectively. It is illegal to use herbicides for any purpose or by any method other than as indicated on the label. Avoid using herbicides on windy days and near bodies of water. Always wear a protective mask, gloves and long sleeves. Make sure children and pets are indoors when you spray herbicides. Buy only as much herbicide as you need and store it in a safe place, out of the reach of children. Herbicides can be divided into two main categories: selective and non-selective. Selective herbicides kill certain types of weeds while leaving other plants unharmed. The herbicide label lists the target weeds as well as garden plants that are unaffected. Non-selective herbicides, as the name implies, can kill almost any plant. Selective herbicides are useful when treating weeds in lawns and gardens. Non-selective herbicides make it easy to clear an area when starting a new garden. Selective herbicides can be further divided into pre-emergent and post-emergent herbicides. Pre-emergent herbicides are applied to the soil, and they kill young seedlings soon after they emerge. Post-emergent herbicides are usually applied to the foliage where they are absorbed into the plant tissue. The type determines when to apply an herbicide. Pre-emergents are usually applied in late winter or early spring, while post-emergents are applied in spring after the weeds begin to grow. When using herbicide in gardens, take care to protect the plants you don’t want to kill. 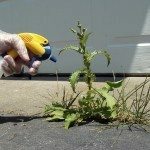 If you have identified your weed, you may be able to find a selective herbicide that will kill the weed without harming garden plants. Those containing glyphosate are good herbicides for hard to control plants and unidentified weeds because they kill most plants. Protect the other plants in the garden by making a cardboard collar to fit around the weed before applying the herbicide.